Artist Kara Raymond began working with metal in high school when she was introduced to jewelry making. Years later, she trained to be a jeweler and metalsmith, taking classes at jewelry schools, art centers and local colleges. Today, Kara works out of her home studio where she makes each piece of jewelry by hand. She pays close attention to shape, texture and movement, revolving her designs around those three concepts. 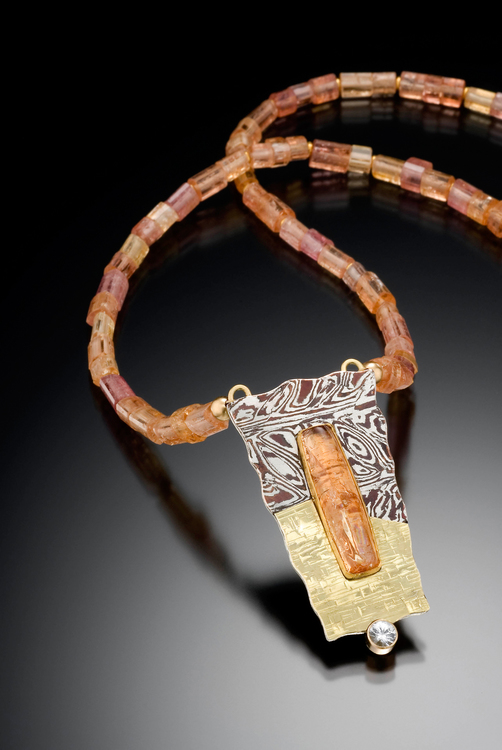 Her two series, Japanese Mokume Gane and Siena, give her the flexibility to work with two very different styles. Mokume, the ancient Japanese technique of metal patterning, features a variety of organic textures, while her Siena series is focused on simplicity and uses pearls, stones and classic metal work. So whether you’re looking for an expressive piece, or something a bit more understated, stop by Kara’s booth and peruse through her selection of beautiful jewelry. Her earrings, necklaces and pendants also make wonderful gifts.